Muxlim: Does a virtual world for Muslims encourage integration? 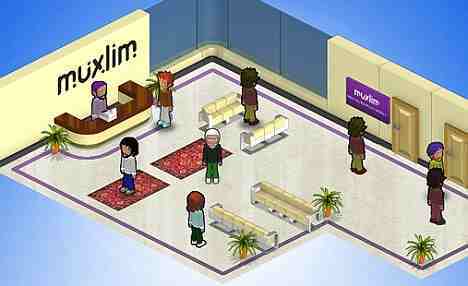 I’ve read a couple of posts today about Muxlim, a new virtual world for Muslims (via the BBC). The stories have been non-negative, if not positive, with even the Daily Mail’s story seeming to be a verbatim press release rather than the expected ‘gone hell in an handcart as technologically literate Muslims take over the web’. But on a web which is already defined by discussions amongst like-minded individuals, is a Muslim virtual world a good idea? Before the jihadists and those damned-liberals start the name calling, let me be clear. I am not picking on a Muslim site, but rather using a Muslim site as an example of the larger problem of integrating groups that often feel marginalised from mainstream society. Virtual worlds can be particularly immersive environments, and having virtual worlds focused on marginalised groups doesn’t seem to be particularly healthy, whether this group is Muslim, Christian, gay or fascist. Rather than promoting understanding amongst different groups, homogeneous virtual worlds are likely to encourage the opinion that we are 100% right and differing opinions are not worth listening to. Whilst it is difficult to be more wrong than a white supremacist, it is nonetheless important there is dialogue so that we understand why they harbour the abhorrent views that they do. Muxlim makes a point of stating that it is open to both Muslims and non-Muslims alike, but as with all sites aimed primarily at one particular group the vast majority are likely to come from that group. Some Christians will probably appear to evangelise, in the same way as you will find some liberals in Stormfront, but the core will be Muslim. On a more technological note. Whilst I tried to launch Muxlim, I had problems connecting to its server. Whether this is a problem with traffic, or a problem at my end (my broadband is currently provided by my mobile phone), I don’t know. From what I can see it is browser based, with all the limitations that involves. Rather than a Muslim ‘Second Life’, it is seemingly more EA-land (defunct), Lively (defunct), or YooWalk.